General Electric plunged to a post-crisis low of $US12.01 on Wednesday. The once-sprawling conglomerate is in the middle of a turnaround effort, led by new CEO John Flannery, but those changes have been slow to change the stock’s trajectory. 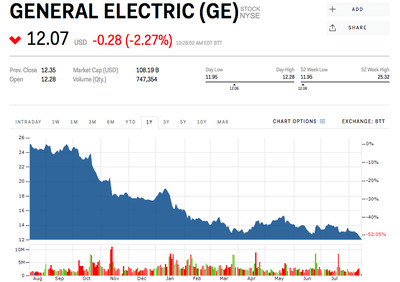 Follow GE’s stock price in real-time here. 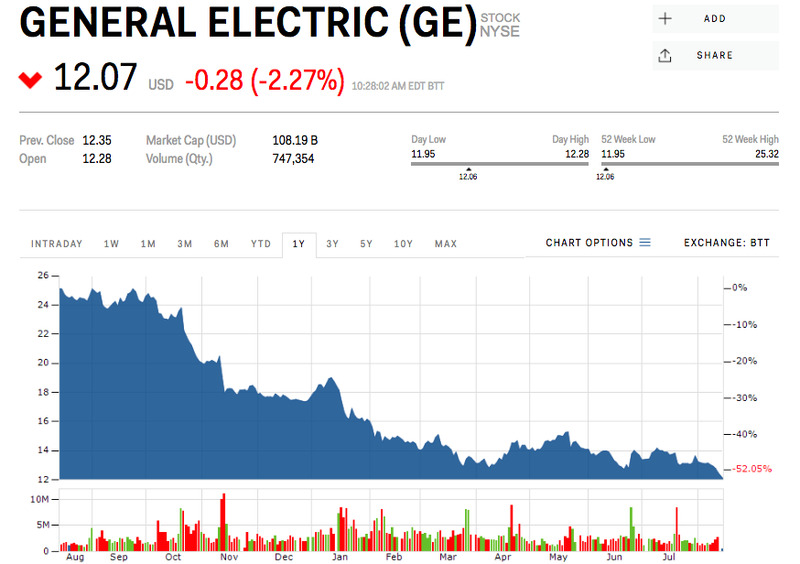 Shares of General Electric sank 2.7% Wednesday, to hit $US12.01, the stock’s lowest level since the financial crisis in 2009. GE’s gross profit has fallen significantly from $US59.19 billion in 2010 to just $US11.49 billion in 2017. The stock has fallen in step. CEO John Flannery, who took over last year from Jeff Immelt, has promised to “maintain a disciplined financial policy” that so far has involved slashing the company’s once-dependable dividend yield and selling or spinning off underperforming units like healthcare and oil and gas. Flannery has trimmed the once-sprawling conglomerate down to three main industries: aviation, which produces jet engines; power, which supplies power plant turbines; and renewable energy, which makes wind turbines. Together, these three units generate about $US71 billion in annual revenue, the Boston Globe reported. Wall Street appears to be slightly convinced of Flannery’s turnaround efforts, giving the stock an average price target of $US15.75, 30% above where the stock was trading Wednesday.